1,500 Voters Agree: This Made-In-NYC Bag Takes The Gold! To get the applause before the performance, the standing ovation before the overture even starts, the orders before the garment goes into production.... these are all artists' dreams in an uncertain world of creative reception. Except if you design for Stitch Collective. The new concept design operation, started by ex-Harvard Law Schooler Loni Edwards, operates under the premise that the shopping community knows what it wants. How it works: Willing designers are challenged with crafting an item to fit a specific need. Then, they submit sketches of their ideas and the Stitch Collective community (anyone who goes to the site to vote) chooses which sketch they like best. The rest, as they say, is history. The item is sent into production right here in NYC, keeping the production local. Most recently, Parsons grad Omar Aguirre won the challenge of creating the "ideal city bag." 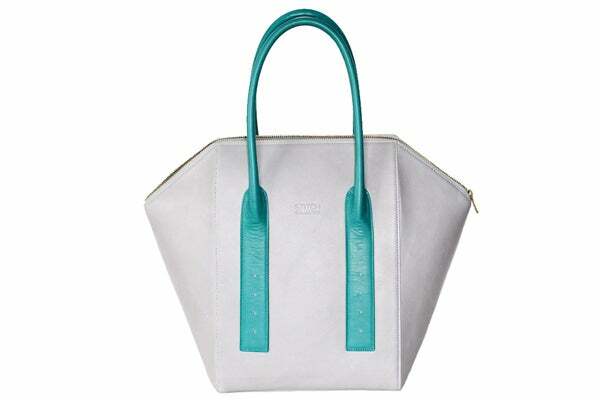 Indeed, the luxe leather and bright, summer color patterns aid in keeping the purse light, despite its practical size. Gray and emerald, and big enough for a laptop, we're calling this the perfect weekend carry on. But, we'll let you vote on it, too. Tell us what you think in the comments below and check out the site regularly for the next designer challenge. The City Bag by Omar Aguirre, $465, available at Stitch Collective.